It’s important for policymakers to see #PrivacyPanic Cycles for what they are. Don’t overreact, says @ITIFdc. This report analyzes the stages of public fear that accompany new technologies when privacy advocates make outsized claims that filter through the news media to policymakers and the public. Dire warnings about the privacy risks associated with new technologies routinely fail to materialize, yet because memories fade, the cycle of hysteria continues to repeat itself. Unfortunately, the privacy panic cycle can have a detrimental effect on innovation. First, by alarming consumers, unwarranted privacy concerns can slow adoption of beneficial new technologies. For example, 7 out of 10 consumers said they would not use Google Glass, the now discontinued wearable head-mounted device, because of privacy concerns. Second, overwrought privacy fears can lead to ill-conceived policy responses that either purposely hinder or fail to adequately promote potentially beneficial technologies. For example, U.S. policymakers have delayed the adoption of various public sector technologies, from smart meters to electronic identification, in part because of the pushback these technologies have received from privacy advocates. 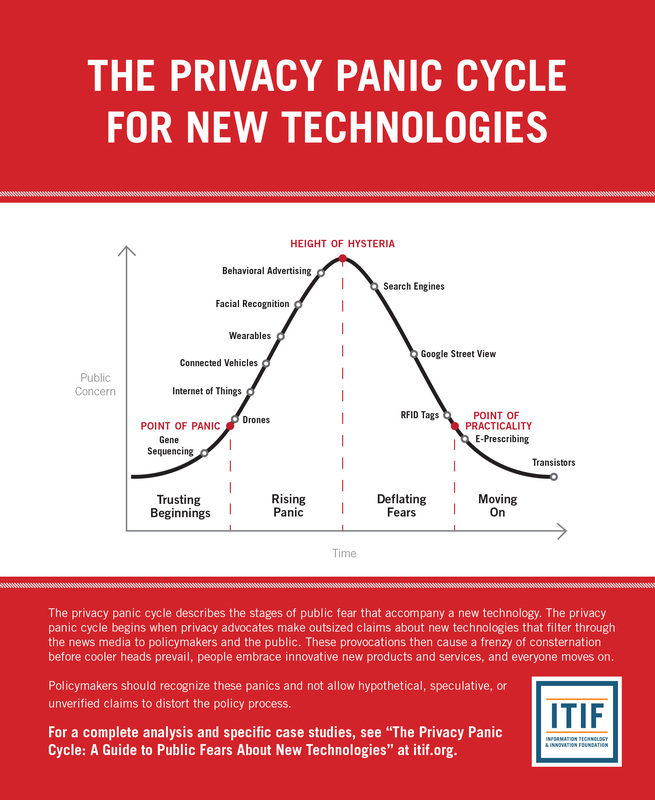 This report describes the common trajectory of the privacy panic cycle and illustrates how inflated privacy concerns have played out for a number of well-known technologies. It looks at what causes the panic cycle and how certain factors have amplified the trend in recent years. Finally, it discusses the need for policymakers to understand this phenomenon so they do not mistakenly implement policies detrimental to innovation based on exaggerated and trumped up fears.